Ori Taylor is the lead singer, guitarist, and songwriter of the Band To Be Named Later, a garage band he started with his friends. After years of being known only as the kid brother of sports star Del, Ori is looking forward to stepping out of his older brother's shadow, learning to perform in public, and rocking the Battle of the Bands contest. Oh, and maybe finally working up the nerve to talk to a girl in person instead of just over e-mail. But when Del suddenly returns from college, he expects Ori to step back into his role of little brother, just when Ori is starting to come into his own. Denise Vega's deft exploration of brothers, bands, friends, and crushes promises to have readers tuning in page after page, because among all the ups and downs of being a teen, one thing's for sure: We all just want to rock on. Introducing ORI TAYLOR and THE BAND TO BE NAMED LATER! You say you've never heard of them? Just wait. TBTBNL is sure to hit it big at this year's Battle of the Bands, and you'll want to say you knew them when. . . . Front man Ori Taylor is looking forward to stepping out of his older brother's shadow, learning to perform in public, and rocking the Battle. Oh, and maybe finally working up the nerve to talk to a girl in person instead of just over e-mail. After all, who doesn't love a lead singer? But when older brother Del suddenly returns from college, he expects Ori to step back into his role of little brother, just when Ori is starting to come into his own. With his confidence wavering, will Ori be able to overcome his stage fright and lead the band to rock glory? Will the Band To Be Named Later ever get a real name? Will their best performances remain in the garage? It's Hard to Rock Out in High School. IN THEIR FIRST-EVER PUBLIC SHOW! COMING SOON TO THE BATTLE OF THE BANDS! I stroke my sleek Les Paul, then slam into a killer riff that sends every girl in the front row screaming for a piece of me. I look out on the crowd, my voice hitting all the notes. I-- "Ori?" --look back at my best friend and drummer, Nick "Call Me the Brew Man" Brewster, and-- "Ori. Dude. You've got to come out now. We're going on soon." I blinked once. Twice. The stage dissolved. I wasn't a rock star. I was a sixteen-year-old dork at the FX Lounge for Mic Night Monday. And I was hiding in the bathroom. Denise Vega is the award-winning author of six books for kids, from toddler to teen, including her "blog" books: Click Here (to find out how i survived seventh grade) - a Colorado Book Award winner - and Access Denied (and other eighth grade error messages). 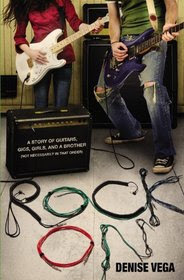 Her other YA novels are the award-winning Fact of Life #31 and the brand new Rock On: A story of guitars, gigs, girls, and a brother (not necessarily in that order). Denise is a Co-Regional Advisor of the Rocky Mountain Chapter of SCBWI (Society of Children's Book Writers and Illustrators) and lives in Denver with her family where she loves to hike, walk, swim, read and eat French fries. Find out more about Denise, her books, and her idiosyncrasies (like the fact that she doesn't like cheese) on her website at denisevega.com or check out her fan page on Facebook: search "author Denise Vega"
I know, I know, it is a YA book, but I am getting in the mood for SXSW -- and this looks like fun! Yep, I need this one, too.